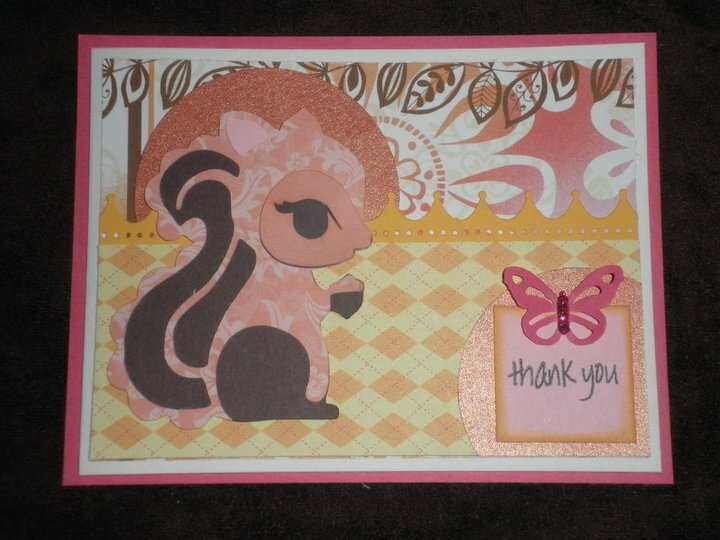 This weeks challenge over at Fantabulous Cricut is to create a project incorporating a critter found at the Zoo. Some of the designers also had to use one of the "Lots of Pun" stamps from Joy's Life. These stamps are so cute! I got "I'd love to Sea you" and "Hot Dog". So for the challenge I decided to make a hershey bar wrapper and incorporate the seal from Create a Critter. 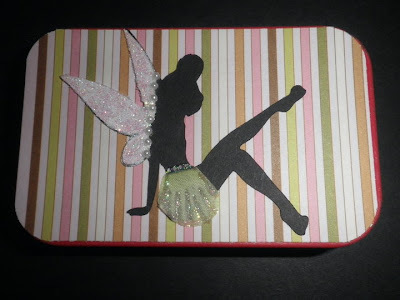 I also used my new Spellbinder Nestabilities that I just got at Joanns last week. Not challenge related but I also received the stamp "Hot Dog" from Joy and made this post it note holder with it. This is on an acrylic frame that I got from Walmart for $1. The Dog and the sheild is from Create a Critter. Make sure to check out all the other great designers projects at Fantabulous Cricut! Here are a couple more altoid tins that I altered this weekend.. I just bought a lot of 220 empties on ebay too so lots more to come!! These were cut from French Manor. I cut up flowers and used the petals for the skirt then added stickles. I've seen this technique used before but never had a cut like this to use it on. Tinkerbell!! After I posted the above ones on my facebook page one of my followers said that she used this technique before for fairies as well. Well I had to try it! Thanks again Sandra!! I also cut the wings out in white and added glitter and pearls. This weeks challenge over at Fantabulous Cricut is "Christmas in July". Yay! I was so excited for this challenge because in January I found this super cute stamp set from cleardollarstamps.com to make your own Christmas Tags using mailing labels. I bought the set because I figured I could make cute little sets of Christmas Labels to sell at my holiday craft fairs. So this is my first attempt at making these. There are 6 pages with 4 labels on each page. This is the cover. The snowman is from Winter Woodlands. Thanks for looking! Make sure you check out the rest of the design teams projects over at Fantabulous Cricut!! 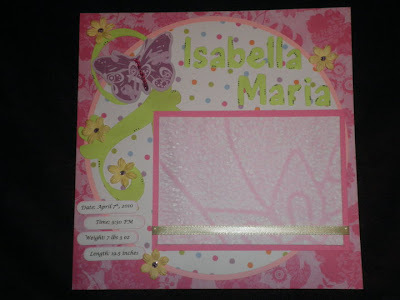 Here are some more pages for the custom scrapbook I am making for a customer. All the "month" fonts are from Pooh Font. The crown and "little princess" are cut from Sugar and Spice. The butterfly is from storybook. This layout did not photograph well. The elephant and giraffe are from Sugar and Spice lite cartridge. "Bath Time" and the duck are also from Sugar and Spice lite cartridge. Sock Monkey is from Sugar and Spice and "So Cute" is from create a critter. "Sweet Pea" and the pea pod are from New Arrival. I also used my peachy keen stamps for the face. Make sure to check back tomorrow for the Fantabulous Cricut challenge! I was asked to make a custom baby girl scrapbook 1-12 month themed for someone. Here is the first couple of pages. The lettering is from Pooh Font, the butterfly is from hannah montana and the swirl is from storybook. Here is the 1 month page. 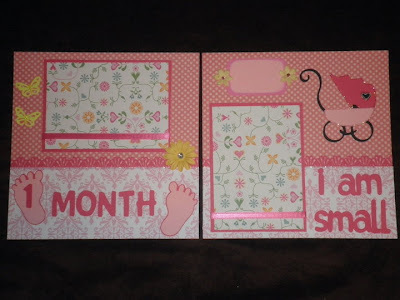 The lettering is pooh font, the feet and "i am small" is from new arrival and the baby carriage is from sugar and spice. 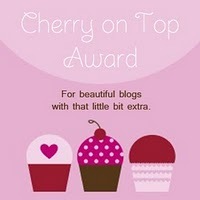 Blog Awards and Blog Hop Winner!! HOLLY C at Out To Recess. Congrats Holly!! I will be in touch to get your address to mail you your prize. Blog Awards!! I went to a family reunion this weekend and didn't have a chance to address all these blog awards I've received until now! These first two I received from Lolis at My Creative Corner and I also received the same two from Kerry at MommaK Crafts. The rules for these awards is to send them on to crafters who inspire me. The next blog award is from Angie at Cokie Pop Paper. 2. Copy the award and put it on your blog. 3. List three things which you love about yourself. 4. Post a picture you love. 5. Tag some blogs you wish to pass this award on to. Three things I love about myself- I love that I have two middle names, I love that I am a crafty person and I love my tattoo. Next a picture that I love... I took this picture in March when my husband and I went to Rome. This is one of my favorite pictures. I love the color of the sky and the lights in the Colosseum. Next to the blogs I wish to give these blog awards to.. Beatriz at Amazing Grace, Alex at You Had Me at Craft, Michelle at Scrappin with my Bug and Robin at Robins Creative Cottage. The card is cut from Wild card. This Ice Cream was cut from Indie Art. This is one of my favorite cricut cuts!! Here is a shot of the inside of the card..
Make sure to check out the rest of the design teams projects over at Fantabulous Cricut! 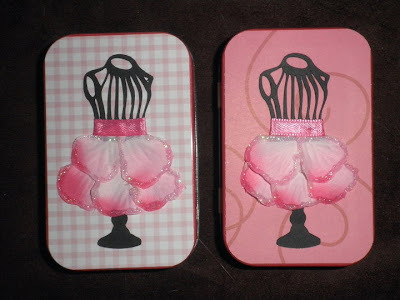 Blog Hop, Tutorial & A PRIZE!! Who doesn't love a blog hop, tutorial and a PRIZE?!?! Thats right!! Today is the day for the Picnic Blog Hop that I am participating in with 9 other fabulous blogs!! Welcome those of you who came from Kim at Kreative Krafts . If you didnt come from Kim's blog and would like to start at the begining of the blog hop, please visit Sarah at Pink Cricut. The theme for the blog hop is Picnic!! I decided to make one of my favorite things to make, sour cream containers. Also lots of you have asked for a tutorial on how to make them so all that information is in this post!! Whoo Hoo!! After you read my tutorial make sure you hop on over to Jenny at Crazy about Cricut!! Also did I mention PRIZES??? Yes! I am giving away these clear stamps along with some surprise handmade goodies to a lucky winner who comments on this post. Also if you comment on all the posts for the blog hop you are eligible to win a CRICUT CARTRIDGE!! Now on to the Tutorial.. Step 1: Cut your 8 1/2 x 11 paper into 4 sheets of paper that measure 5 1/2 x 4 1/4. Since I use vellum I like to stamp on mine so I stamp on one side and let dry for about 5 minutes. I use memento ink but you can use any type of paper. If you use designer paper then stamps aren't needed. Step 2: After your ink dries turn your vellum over so you are adding the red tape to the inside and put your red tape on your vellum just like this.. Step 3: Remove the red peel from the side and bottom nearest to the side. Gently overlap the side with the tape on the other side so it forms a circle like this.. Step 4: Pinch the bottom together so it looks like this.. Step 5: Run the bottom through the crimper and make sure to only crimp about 1/4 an inch or so. Step 6: Add your candy and then remove the red peel from the top and pinch together in the opposite direction of the bottom. Step 7: Run the uncrimped side through your crimper and your container should now look like this.. Step 9: Load your paper in to your cricut to cut it out then glue it together. Step 10: Punch a hole in the top of your sour cream container and in your decoration. Use ribbon to tie it together and Voila- your sour cream container is finished!! Thanks for coming by today! Make sure to hop on over to Jenny at Crazy about Cricut!! 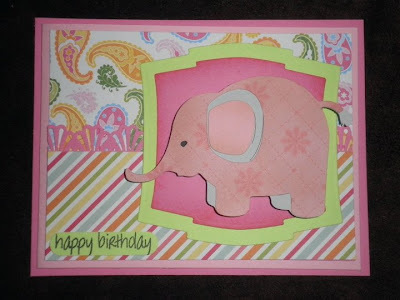 Here are some of my latest cards that I have done for some of my winners on my Facebook page.. This one is cut from Cindy Lou. 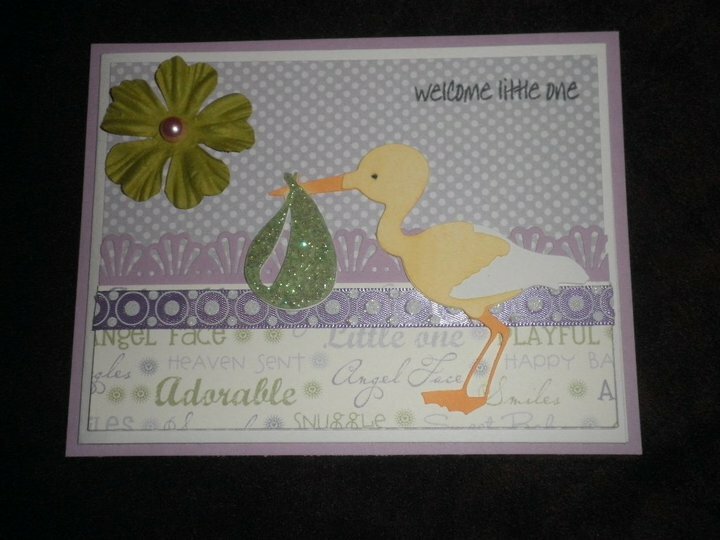 The stork is from Sugar and Spice lite cartridge. 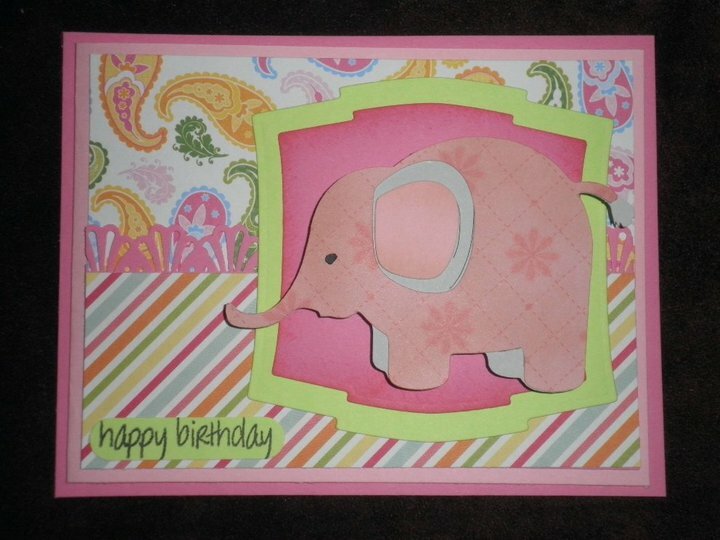 This elephant is also from Sugar and Spice. Love this elephant!! 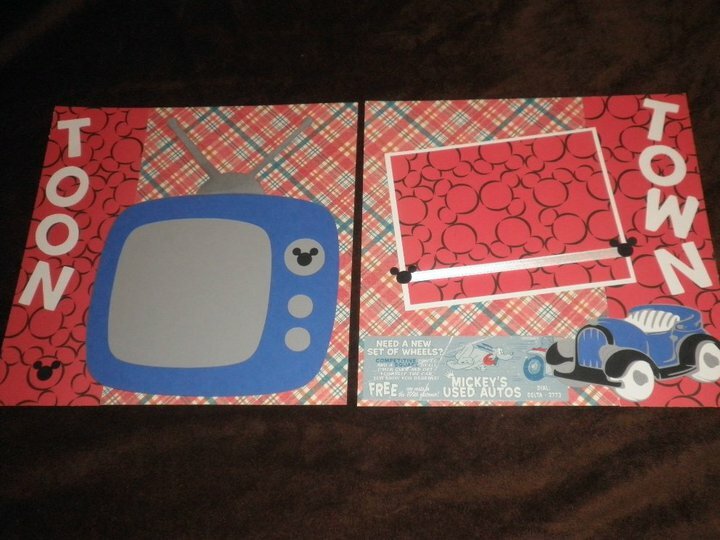 Another layout for my Disney scrapbook.. The TV and Car are both cut from Mickey & Friends. The font is keystone.. again kind of plain but I figured once the pictures are added it wont look as plain.